In the traditional commercial news model, the source of revenue is self-evident. Advertising and circulation pay the bills. If one wants to know who is providing financial backing for the operation, one can simply examine the ads. In a non-profit model, however, even when there is advertising revenue, the source of the lion’s share of the money may or may not be so obvious. That brings in the question of how transparent a site is about who is providing funding. In the more familiar non-profit media model, public broadcasting, there are rules about disclosure. How transparent were the sites and their benefactors about where their money comes from? How explicit were they about the overall mission of those charitable organizations that might shed light on why they had financed the site? How simple is it to contact one of these sites? The study examined each of the sites for all three of these elements-transparency about funding sources and mission and also the accessibility of the staff. In addition, the study examined how transparent any parent organizations or major funders were about their finances and mission. Researchers then combined these three indicators into a scale. Researchers found that the level of transparency varied from site to site and from group to group. In general, however, the more transparent sites tended to be more balanced in their content. Sites that disclosed less about their mission and funding tended to be more ideological in their content. 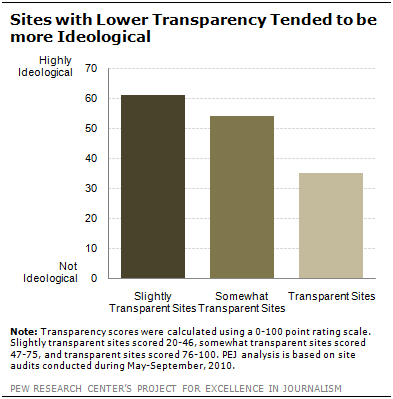 Liberal-leaning sites, however, were somewhat more transparent than conservative ones. Among the most transparent sites was Texas Tribune. A visit to the site’s “about us” section provides an overview, in more than 500 words, about its mission, biographical information on its founders, and a summary of its makeup and revenue streams (elsewhere on the site, one can access a recent Texas Tribune 990 form). The site’s “Support us” section introduces visitors to another set of pages-the donors & members page, listing every donor who have given at least $10, and the corporate sponsors page, listing more than 60 founding sponsors. And a contact page at the Texas Tribune website provides phone numbers and e-mail addresses for its entire staff. Among the least transparent sites was the Alaska Watchdog of the Watchdog.org family. The site had no “about us” section; nor was there any description of the site’s funding sources. One clue appears on the “contribute” page, which has a link to the Alaska Policy Forum, a conservative think tank. The Alaska Watchdog’s connection to the Franklin Center seems clear from the web layout and the name. But no mention of the relationship is made on the site (a fellow Watchdog.org outlet refers to the Alaska Watchdog as a “bureau” of the Franklin Center.) Neither the Alaska Policy Forum nor the Franklin Center reveals information about their own sources of funding. All sites had at least some information about one of the elements. Thus, no site scored zero-only one scored below 40. The majority of sites scored above 60. 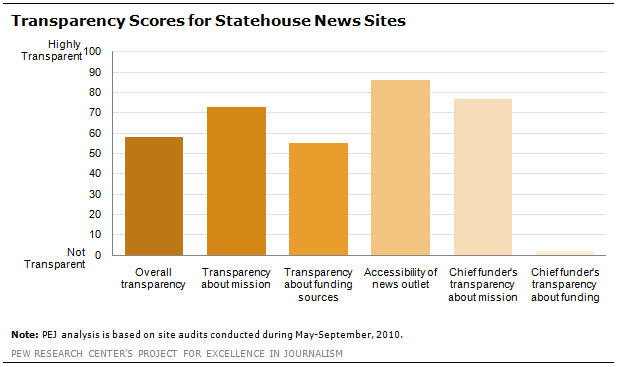 The sites that make up the Statehouse News consortium were, by a narrow margin, the least transparent group in the study scoring 58 on the overall transparency scale (a score of 100 would indicate the highest level of transparency). Individual Statehouse sites themselves, however, ranged some in their transparency. Maryland Reporter, for instance, scored 80; the Tennessee Report scored 20. The lack of transparency related mostly to what the Statehouse sites or their parent organizations said about their funding. Two of the Statehouse group, Missouri News Horizon and Tennessee Report, did not indicate anywhere on their websites who funds their work. And only three of the 11 sites-Maryland Reporter, Texas Watchdog and Pennsylvania Independent-provide comprehensive information about their funders. When it came to the funders themselves of the Statehouse sites, not a single one provided any information about where their money came from. Instead, with phrases such as being funded by “individuals, foundations and corporations” (Idaho Freedom Foundation) or “donors like you” (Tennessee Report), in every case, the foundations and non-profits that fund the Statehouse News sites included a variation on the following statement: We protect the anonymity of our supporters. 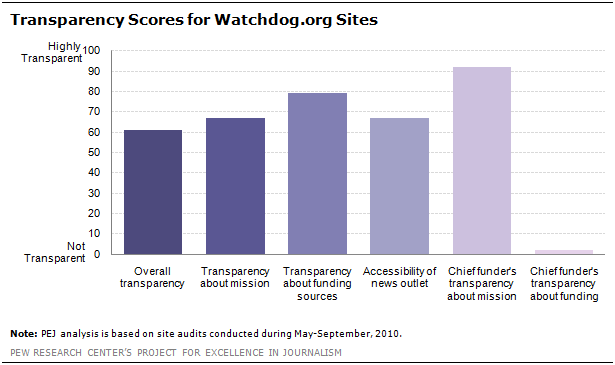 The Watchdog.org family of sites was the second-least transparent in the sample, scoring 61 on the 100-point transparency scale. 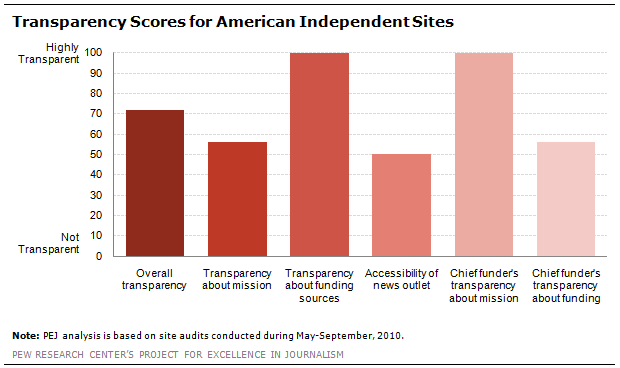 The sites making up the American Independent News Network overall were more transparent than the Watchdog group but only somewhat. On average, the group scored 72 out of 100, placing them somewhere between the least and most transparent sites in the study. The individual news sites generally do not offer much about their own objectives. Instead they refer visitors to their parent publisher, who is also their funder, the American Independent News Network (formerly the Center for Independent Media). The parent organization does offer some information about funders, listing major donors by name, though not linking or describing them. 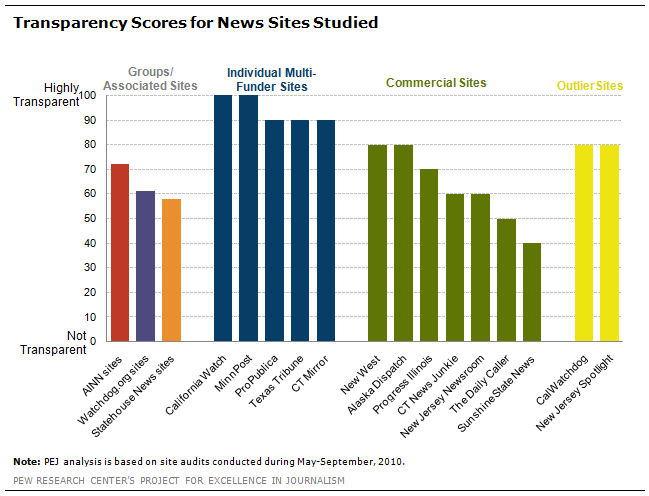 The most transparent sites studied were generally the individual multi-funder sites. While all operated separately of one another, the sites in this category shared a common approach to providing information about themselves and their funding sources. None of the five sites scored below 90 on the overall transparency scale. When it came to describing mission, each scored a full 100 on this element of the transparency scale. The individual multi-funder sites were also highly transparent about their funding. The Texas Tribune, for instance, lists the name of every supporter who has given at least $10. MinnPost released a year-end report on its site listing its major philanthropic supporters and the dollar amounts they have contributed. And all of the sites provide financial documents and reveal the names of the foundations that provide support, most with links to those foundations’ websites. In general, the foundations that support these individual multi-funder sites also tended to be highly transparent about their mission and their finances, though there were exceptions. Most notably, the Sandler Foundation-a chief supporter of ProPublica-does not have its own website, thus limiting what news consumers can know about the foundation and its finances. But otherwise the foundations that funded these sites’ work were, on the whole, detailed and methodical about revealing their financial dealings to the public. Many of them provide a history of the foundation on their website. The John S. and James L. Knight Foundation, which supports each of these independent sites, offers a page that tells the story of the Knight brothers and the assets that provided the basis of the foundation’s wealth. In addition, nearly all the foundations provide some combination of an annual report, list of grantees and tax filings from recent years. The commercial sites tended to vary widely in terms of transparency. There were those like New West that were scored as highly transparent (80), but also those like Sunshine State News that were not (score of 40). On the whole, though, the commercial sites tended to be open about their mission. Six out of the seven sites provided detailed descriptions of their purpose. The exception was The Daily Caller, whose relatively sparse “about us” section mentions the two founders of the site and provides a brief several-line description of itself as a 24-hour news site providing original reporting. There was somewhat less information about the investors and institutions behind these commercial sites. One site, Progress Illinois, was launched by the SEIU, a service workers union, which provides a detailed description of its mission online. Other sites, launched with the financial backing of one or two individuals, provided less information about those persons. The Alaska Dispatch’s description of its patrons was more detailed than the typical commercial sites studied. It mentions its founders “Alaska journalists (and husband and wife) Tony Hopfinger and Amanda Coyne” and then “Alice Rogoff, a longtime supporter of journalism and a former chief financial officer of U.S. News and World Report” who became the majority owner in 2009. But the commercial sites were not particularly clear as a group about their financial backers. Most of the sites mentioned the individuals or entities that launched the site, but few described them in detail. An exception was New West, which provided in-depth information on its initial investors and where their own income originally came from (the site was founded by Courtney Lowery and Jonathan Weber, both journalists). In practice, tracing the trail of money from a Watchdog.org site to its ultimate sources can be a challenge for a typical news consumer. A visitor to the Nebraska Watchdog, for instance, would click on the “about” section of the site to find that it received funding from the Franklin Center. But to learn more about the Franklin Center, the visitor would have to do a separate web search, as no link is provided on that page. Once on the Franklin Center’s website, the only information provided about its donors is that their anonymity is protected. The only way to learn about the Sam Adams Alliance connection would be to stumble upon it serendipitously through a web search or to read about the relationship in other investigative journalism looking at the Franklin Center family of sites. On its own site, redesigned in 2011, The Sam Adams Alliance says nothing about its funding. Three members were an exception, choosing to remain anonymous. The Knight Foundation, which provides financial support to a number of sites in this study, has also provided support for the Pew Research Center and the Project for Excellence in Journalism. Even journalists have had some difficulty parsing out details about Sunshine State News, one of the commercial sites in the study. The St. Petersburg Times reported that one of the people originally listed as among the owners of Sunshine State News in papers filed with the Florida Department of State was Justin Sayfie, a former communications director for Republican Governor Jeb Bush and founder of Sayfie Review, a news service. (Sayfie later told the Times he was no longer involved in Sunshine State News.) Managing editor John Wark told the Times that the site is privately owned by a group of investors. Little else is known about who is backing the site. What’s Next for Nonprofit Journalism?